HUBER+SUHNER Astrolab has been recognised by Raytheon Integrated Defense Systems (IDS) for its achievements in quality and performance. 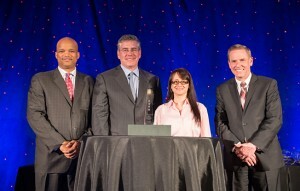 Stephen Toma and Wanda Contreras from HUBER+SUHNER Astrolab were presented with the Four Star Supplier Excellence Award 2014 at Raytheon’s annual supplier conference. Raytheon’s Integrated Defense Systems (IDS) business established the annual Supplier Excellence Awards programme to recognise suppliers who provided outstanding service and partnership that exceeded customer requirements. Award candidates are judged on multiple criteria, including overall quality, on-time delivery and continuous improvement. HUBER+SUHNER Astrolab was one of 87 companies, selected from more than 2,000 suppliers, to be recognised by Raytheon’s Integrated Defense Systems (IDS) business for 4-Star honours.